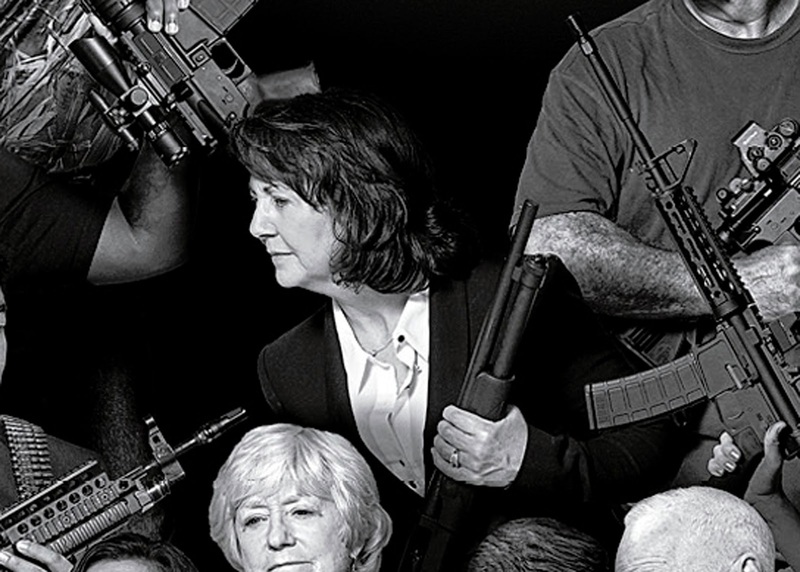 Time magazine recently had a cover story titled "Guns in America" that features 245 people across America who share with Time readers their views on guns. Two of those people live in Richardson, Texas. Both are opposed to gun reform. Chris McNutt is in the far right (of the photo, I mean, not on the political spectrum, although that wouldn't be wrong). 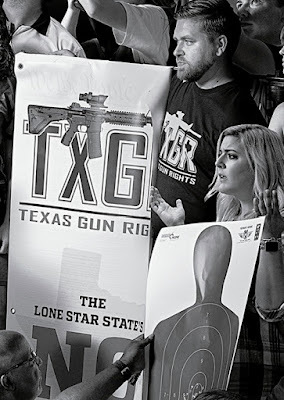 He's standing by the TXGR (Texas Gun Rights) sign that features, oh I don't know, I'll call it a machine gun until an expert correctly identifies it in the comments. Mabel Simpson is just below the "M" in the center. She's also holding a machine gun (again, a placeholder until some defender of liberty enlightens me in the comments). Chris McNutt and Mabel Simpson are related but I don't know that plays into this story. Texas Gun Rights (TXGR) - the only 'No Compromise' gun rights group in the Lone Star State! But what does 'No Compromise' mean? We believe in 100% firearms liberty for Texas. We believe the Second Amendment is the only 'permit' you need to keep and bear arms. For far too long, establishment, access-based gun lobbying organizations here in Texas have sold out gun owners and liberty lovers for political expediency and personal gain. Source: Texas Gun Rights . I wonder why he didn't lead with this in his "Vote NO" campaign in RISD. You'd think that "No to Taxes, Yes to Guns" would have been a winning message for our schools </sarcasm>. There were many people who opposed a tax increase, but Chris McNutt is who they ended up with leading that opposition. Personally, anyone whose position is "No Compromise" for one controversial issue is not someone I want influencing policy for schools for any issue, whether tax policy or gun policy or anything else. The Constitution is history's greatest example of the benefits of compromise. Without compromise by our nation's Founders, we wouldn't even have a Constitution, so McNutt's "No Compromise" attitude is ironic as well as unwise. "Guns don't kill people. Bad behavior kills people." — Mabel Simpson. This blog post is not the place to argue for research into safer gun design (to reduce the hundreds of accidental gun deaths each year), although I think it's common sense. This is not the place to argue for policies like limitations on the right to possess guns by perpetrators of domestic violence (to reduce the hundreds of firearm-related homicides by domestic partners or former partners each year), although I think it's common sense. This is not the place to argue for more funding for mental health programs (to reduce the thousands of firearm-related suicides each year), although I think it's common sense. No, this is not the place to explore what reasonable regulations might reduce gun violence without placing an undue burden on Constitutional rights, because, well...Mabel Simpson just isn't hearing any of that. Because she knows that "guns don't kill people." She represents me on the Richardson City Council, which has the power to take action, however small, however indirect, but thoughts and prayers are all she can offer victims of gun violence. I'm always learning just how uncommon common sense it. I thought twice about publishing this. I honestly don't know if Chris McNutt and Mabel Simpson's position of "no compromise" on guns helps them or hurts them with voters in RISD and the City of Richardson. If it helps them, I don't want to advance their careers by giving them free publicity for their pro-gun message. But in the end, I decided I had to express what I think, just like they did, and trust my neighbors to make good choices. POTD: Opera House or Wind Chime?